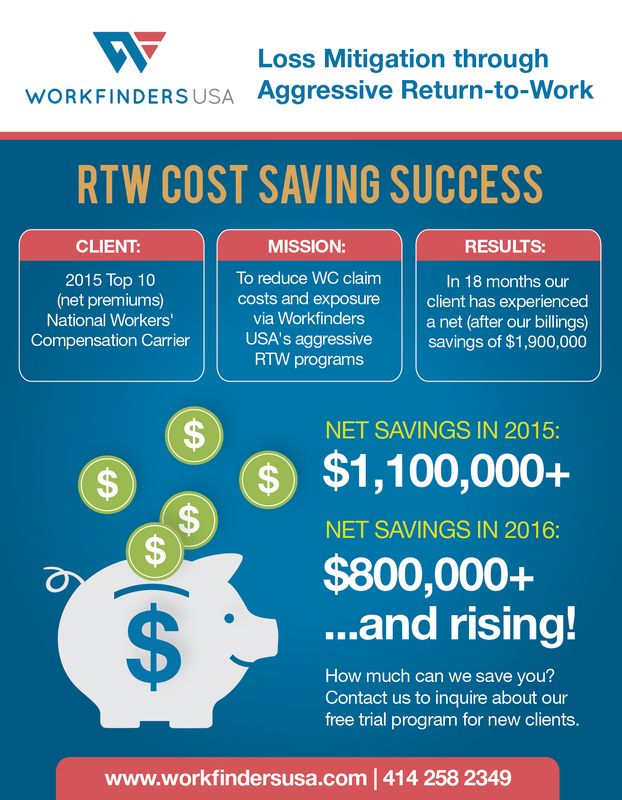 Our Return-to-Work program reduces workers' compensation costs for carriers, employers, TPAs and self-insureds. How much so? From Jan 2015 to present (June 2016), we have saved a prominent national carrier $1.9 million NET (after our billings) in 18 months across 14 states. That's over $100k in net savings per month! This particular client has referred a wide variety of claims. Typical job titles of workers include: housekeeper, driver, manager, landscaper, electrician, plumber, waitress, chef and many more. A few of the states we have worked in through this client include: NY, NC, VA, MD, IL, MI, MA, WVA, VA and several more. We have proved our RTW program works across varies job industries/vocations, across various states. How did we do it? First it takes an excellent partner to work with, like this particular client. They trusted our program on a multi-state basis and we delivered. Secondly, it takes excellent communication between vendor and client. We always preach constant communication, and we feel it's critical to always keep the client informed as often as possible. Third, it takes the vendor knowing and understanding state laws. Our counselors are up to date on state-specific forms, procedures and requirements. And if we ever have a question, we are not shy to give your defense attorney a call. Finally, it takes a RTW system that actually works. Many RTW companies claim to provide such services, but very few do it the right way. Lazy/Poor RTW = PTD outcomes. Yes, please send me info!